There are a number of reasons you might be considering the design of your pharmacy. Perhaps you are interested in redesigning just the pharmacy section of a larger store or maybe you’re building a new structure and you’re searching for the best design options. 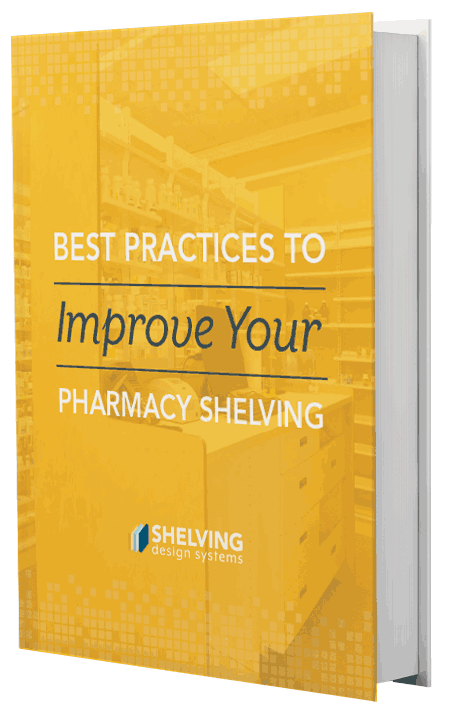 Regardless of why you’re looking, our guide provides essential best practices in several areas, including pharmacy design, how shelving can impact sales, how to improve safety and security with your design, ensuring that you meet privacy requirements, and considerations for improving your pharmacy workflow. 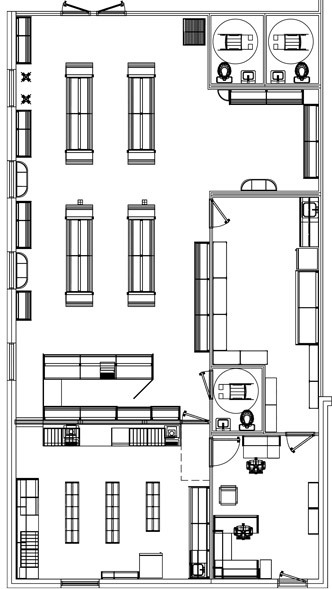 Is a Traditional Floor Plan Right for Your Pharmacy? Can Pharmacy Shelving Help You Meet Privacy Requirements? If your sales have slowed down or your shelving is simply outdated, a new and modern design might be in order. However, before you make a change, there are a few considerations to keep in mind. One area to consider is product categories that aren’t moving out of the store. It’s important to ensure that products are shelved in categories, there’s ample space between brands, and there’s enough contrast between products. Next, consider how customers feel in your store. Do they feel that they can find a variety of products? Are they confident that you are focusing on their needs rather than commercial interests? Third, there’s nothing worse than a disorganized, cluttered display. Making sure that your shelving is able to display products in an organized fashion will help customers more easily find the products they’re searching for in an approachable way. Lastly, consider the ability to safely display controlled products without impeding your customer’s ability to see and purchase them. An innovative shelving design can do just that and even increase sales when executed properly. While attractive shelving is a must for your displays, that’s not the only consideration. Pharmacy fixtures should also be functional. A functional pharmacy display keeps your merchandise organized and displayed properly. One option is gondola units, which can hold almost any item effectively. Another aspect of functional shelving is that they can be used again and again. Purchasing high-quality shelving units will provide you with long-lasting shelving solutions. To address the attractive side of pharmacy fixtures, as we mentioned before, the way your store looks matters to customers. It affects how they feel while in the store, as they look for the items they need. And yet another aspect of making sure your fixtures look attractive – your competition is focusing on this. If a competitor’s store looks and feels better for customers, they may choose your competition over you. Related to functional and attractive pharmacy fixtures, retail pharmacy store designs should likewise be appealing and impressive for customers. One obvious way to improve your store’s appearance is simply to update it. An older design is noticed by customers. Consider modernizing different aspects of the store as well as switching from fluorescent lighting to soft indirect lighting. Another tip to help customers as well as sales, is to ensure that products are no higher than eye level. This might mean updating your shelving so that there aren’t displays with higher shelves than others. As a convenience to customers, you might also want to provide seating in strategic locations around the store, especially for customers who have difficulty walking around. It’s also helpful to keep in mind that your signage can clearly guide customers throughout the store and to the sections they’re searching for. Lastly, setting up your store with the product displays in mind is essential. If customers are encouraged to stroll throughout the store, they will more easily see the products you have on display and potentially find items they didn’t realize they needed. As mentioned earlier, gondola shelving is an ideal option for pharmacy floor plan designs and creating optimal displays. There are many options to consider, including height, width, length, color, construction material and center wall configuration. This type of shelving is popular in stores for its ability to divide the area into sections, create aisles, and foster a specific traffic flow for your customers. Another benefit of modern gondola shelving is that they are lighter in weight, but still just as strong as older ones. With steel framework, they are strong, durable, and capable of supporting heavy loads. Are the shelves capable of displaying the products you sell? Will the shelves fit in with your store’s branding and the image you want to portray? As you can see, gondola shelving provides endless options for your pharmacy design. Now that we’ve reviewed some of the basics of pharmacy design, let’s discuss if a traditional floor plan is right for your pharmacy. Whether it’s a new build or a redesign, determining a floor plan beforehand is a crucial step. There are many decisions involved with shelving and design fixtures, but first you must choose the best floor plan, which will ultimately guide the rest of the design. Many stores choose to use a traditional grid or straight layout, but there are other options such as combination and free-flow floor plans. There are many benefits of a traditional floor plan. First, it provides maximum usage of available floor space. Another benefit is that you can set up shelving parallel to the store’s side walls and create sections. Even with a traditional floor plan, an option like gondola shelving can provide an aesthetically pleasing display and also makes it easier to get around the store. Depending on your store floor plan, customers will pick up prescriptions but also be encouraged to look at displays on the way out of the store. When it comes to the design of a long term care pharmacy, design needs to be approached a bit differently. Since long term care pharmacies are typically located in a hospital, nursing home, skilled nursing facility, group home, assisted living facility, or hospice, the focus is completely on the quality of care for patients. A few areas to consider for long term care pharmacies include the use of technology and pharmacy workflows. Using computers and its programs can assist with electronic drug prescribing and dispensing, while also monitoring the safety of the different medications patients are using. With automated dispensing machines, allow for secure storage of medications and also alleviate the need for manual documentation of supplies and allow for a more accurate inventory. Lastly, considering the pharmacy workflow is another key aspect of your design. Thinking about the proper placement of shelving, counters, desks, and other component fixtures will improve the efficiency of your pharmacy. As you consider the best options for your pharmacy’s design, review these dos and don’ts as far as they pertain to the back end and front end design. DO make sure the pharmacist has a computer and telephone at the prescription drop-off counter. DO ensure that needed supplies and equipment are within easy reach. DON’T neglect the proper workspace ergonomics with desks and counters at the proper height, comfortable chairs, and floor mats. DON’T forget to provide a comfortable waiting area for patrons. DO utilize shelving so that customers are directed around the store in a counter-clockwise direction. DO feature point of purchase displays to foster impulse buying, particularly near the checkout register. DO aim to make your store an inviting and customer-friendly environment. DON’T use standard linoleum flooring or fluorescent lighting and aim to include natural lighting for a more comfortable environment. While functional, drug store fixtures can also directly impact sales. Fixtures can make or break a display, which is why it’s important to make them as visually pleasing as possible. It’s important to choose shelving that features the merchandise rather than serve as a backdrop. The right fixtures also have the ability to make your store more inviting. By creating an environment that’s comfortable for customers, they will be encouraged to spend more time in the store and find the items they need. Another way fixtures impact sales, is by supporting your brand. Ideally, you can choose fixtures that either complement or match your brand’s colors. This is a great way to help customers remember your store when they’re considering where to go for an item they need. Now that we’ve shared the importance of choosing the right fixtures, let’s look more closely at how poor-quality shelving can work against you and even hurt your bottom line. The first area to consider here is budget. To ensure you plan for high-quality shelving, include this in the budget before starting your build or remodel. This will prevent you from waiting until purchasing shelving at the end of the project using only the funds you have left. Old or worn shelving is another area to consider. If your shelving units are deteriorating, it can make the products on display appear poorly as well. In addition, cheap shelving is easy to spot, not to mention that sagging shelves with chips, cracks, or sharp edges aren’t safe. The safety and security of your pharmacy design cannot be overlooked. This should affect every area of the store from doors and windows to the safe storage of narcotics in the dispensing area to shelving design. One essential way to keep your store safe is the installation and use of cameras, motion detectors, and other alarms that will notify you and authorities should a break-in occur. In order to protect customers, your pharmacy design should also take into consideration how solid and safe your fixtures are. This may also include ensuring that aisles are wide enough and products are within easy reach. A third area to consider when it comes to safety, is the dispensing of medication. The appropriate equipment can ensure that you have a smooth and efficient workflow as well as prevent any inaccuracies. Lastly, technology that uses e-prescribing and incorporates electronic health records (EHR) can be incredibly helpful. Another aspect of shelving that’s vital to consider is how your pharmacy can meet privacy requirements. With stricter rules regarding the security and privacy of health information and data, pharmacy owners must ensure they adhere to HIPPA requirements. Keeping patient privacy in mind, you can choose to design your pharmacy so that patient privacy and medical information security are upheld. It’s crucial that there are areas that can only be accessed by authorized personnel and that there is space for patients to discuss private health issues with staff members, as needed. Phone calls regarding any medical condition or personal information such as billing or insurance data, should be made in a private area without risk of being overheard. With newer regulations in place in the last few years, pharmacies must ensure they make necessary changes in compliance with both federal and state laws. The final area to consider when it comes to improving your pharmacy’s design is its workflow. There are several areas to consider in order to ensure your pharmacy is running efficiently. Identify just how things actually get done – Through reviewing each step involved, you may find areas of improvement. Narrow down each of the inefficiencies found – Determine which steps do not add value for the customer and eliminate those steps. Look for any bottlenecks that are occurring during the filling process – This means counting how many steps technicians are taking and determining how you can decrease the amount of walking they’re doing. Invest in some of the automated technologies – By utilizing technology, you’ll provide more time for the pharmacist to perform other necessary activities. Inventory management – Consider investing in an automated inventory program to keep your inventory at the appropriate level. Now that you know everything there is to know about best practices for pharmacy shelving design, take the next step and request a complimentary consultation to determine the best solution for your space.